It is believed that practices similar to reflexology could well have been around in previous historical periods. 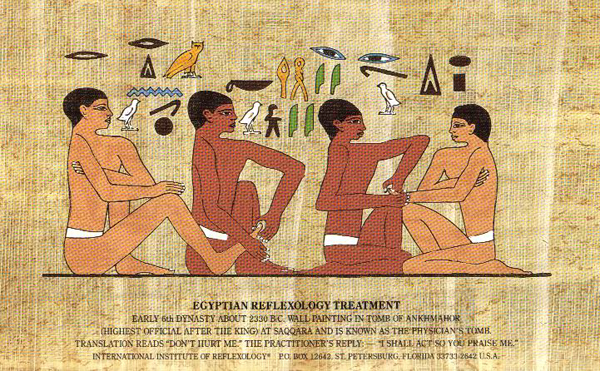 Whilst the specific origins of reflexology have never been formally documented, on the walls of a Sixth Dynasty Egyptian tomb (c. 2450 B.C.) reliefs that depict two seated men who look to be giving each other a hand and foot massage. This is the nearest source for reflexology ever discovered. In 1913, a nose, and throat specialist called William H. Fitzgerald, M.D. introduced reflexology to in the USA. Along with Dr. Edwin Bowers, it was William claimed that the process of applying the right kind of pressure to areas of the hand and foot anesthetic effect on other areas of the body. Following this, Eunice D. Ingham modified reflexology in the 1930s and 1940s. He was a nurse and physiotherapist who believed that a human’s hands and feet were particularly sensitive, and mapped the entire body into “reflexes” on the feet renaming “zone therapy” to reflexology. Ingham’s theories are prominent in the United States and United Kingdom, although modern methods also exist.